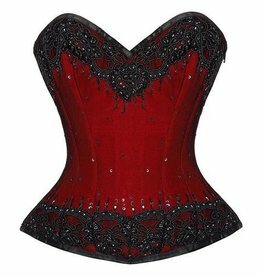 The red satin overlaid with black floral lace adds a dramatic fantasy feel to any outfit, while the black satin accent panels further accentuate the hourglass shape of this stunning overbust corset. You'll shine in this Silver Iridescent Overbust corset, whether it's a dark goth scene or a cosplay fantasy. Electric Purple Iridescent Overbust Corset: This corset will make you stand out in any crowd. 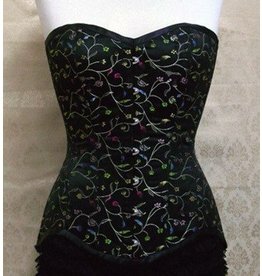 Black Floral Brocade Overbust: This is a classic. Everything and everyone looks great in black. The simplicity of this corset is what makes it a statement piece. 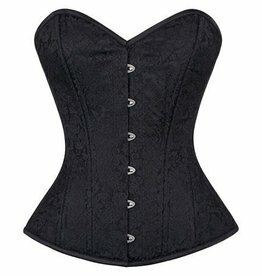 This beautiful Chatterley over-bust corset is reminiscent of an Edwardian shape.